Wilshire Blvd. & Normandie Ave. Parking is located around the block on Mariposa Ave, south of Wilshire Blvd, behind Halal Guys. We validate your parking with $30 or more purchase per ticket. We have 13 Karaoke Rooms for all party sizes! Whether celebrating a special occasion with family and friends or hosting a corporate event, The Venue can accommodate all of your special event needs. 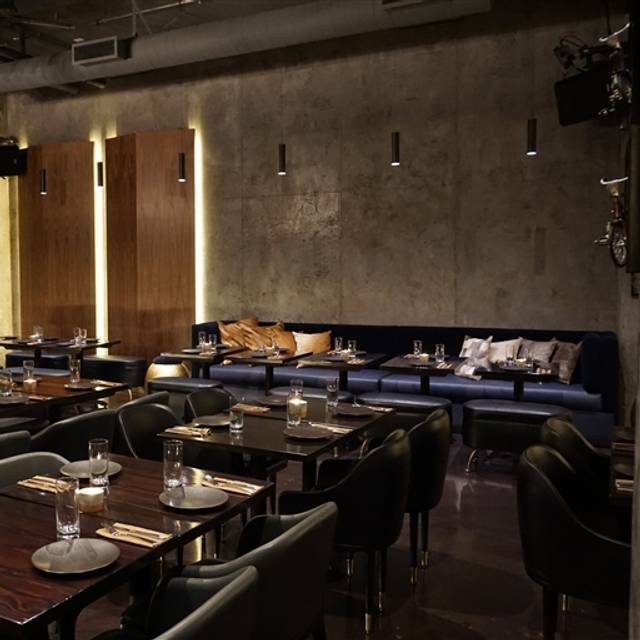 The Venue, located in Koreatown, is the first dining and karaoke establishment of its kind. 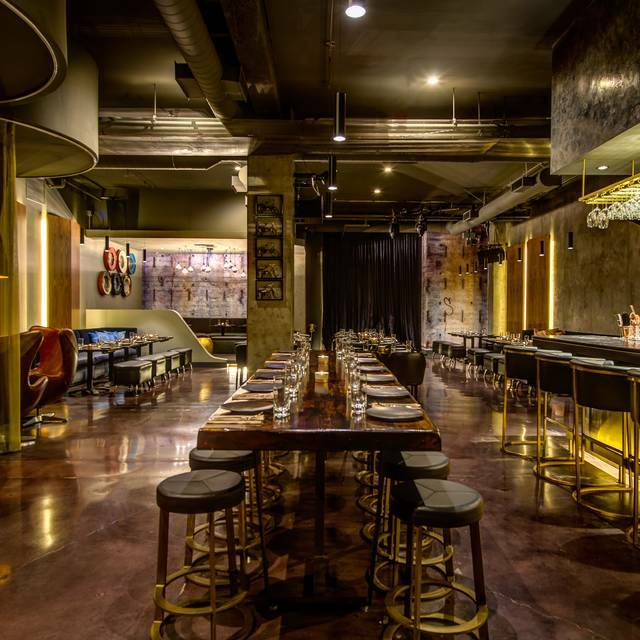 The stunningly designed, cavernous, underground restaurant & bar offers a wide option of eats and cocktails, as well as 13 private karaoke rooms. If you would like to make a karaoke reservation, please make sure to note it in the reservation notes. For parties of 9 or more, please call the restaurant at (213) 221-1251 to make a reservation. 3 Course Special Valentine's Menu that starts off with our featured cocktail - special someone - prosecco, pomegranate, rhubarb, and absinthe. This place was a little hidden. It was attached to a business tower that you would not notice at first, but the entrance way is very nice. The overall atmosphere where beautiful. Super cool modern look. The services was on point. And food was interesting combination and delicious. I would strongly recommend the fried Ramen egg. 5 stars all around. Great place for drinks with friends. Food options are slim but delicious. DJ comes at 10 so must be done with reservation by 10pm. Great place amazing service but not many vegan options (or knowledge ) offered by the chef... regardless will def go back! My wife and I went at 5:30 because we had a concert to attend at the nearby Wiltern Theater. We were the only customers in the place, which is clearly more of a nightspot than a major dining venue. That felt a bit strange. There are something like 12 private Karaoke rooms, which are awesome if that is your thing. That being said, the wait staff was very helpful and the food, essentially an Asian fushion, was terrific. The food was really delicious and the dining area was really tastefully decorated. Beautiful, dark ambiance with a mid-century modern style. What you expect from a K- town underground restaurant. They had a lounge singer come in which was a nice touch. They had a preset menu at $80 a person which was bit high but seemed like the only option. Food was okay, didn’t blow me away. Our waitress was great but the only thing I was disappointed was the automatic gratuity added onto the 2 person check. I would come back for the karaoke rooms. The ambiance and the service is excellent.....they have a wonderful menu and drink options that they craft themselves!!! Funky location but really cool. Loved the decor. Our waitress was a gem and made us want to try all of the offerings in the “cocktail program”. We settled on a few and everyone enjoyed them. The food was amazing and we even made room for some dessert. It got a little loud around 8:30 but that is to be expected in a karaoke facility on a Saturday night. I love high class established restaurants, because they don't have to be pretentious by secluding themselves. The Venue is by far one of the most welcoming places. I live next to the hot spot in the neighborhood and it is from now on my favorite places. I showed up in joggers and alone, the service was still wonderful as if I was wearing a suit and my fav waitress made my stay more than comfortable without making me feel awkward for the fact that I was eating alone (not that I ever felt awkward but it is one of the things I noticed in other establishments). To describe the food, I wouldn't find any adjectives that do this deliciousness justice. It is an experience worth doing over and over again. Dinela was a fantastic tasting menu! Ambience was great and they play really good music but food was so-so. Main dishes were not sent out at room temperature which made it less enjoyable. I really enjoyed my visit here. They have restaurant, bar, and even private karaoke!! general atmosphere was great and food and drinks are excellent. This is really a five star VENUE for your night out. thank god they gave me a house cake for my Bday party. I will be there one day again when i have a GF.. I honestly didn't expext much of the place and I was very surprised. The interior was modern and fancy. The vibe was perfect for a date night with dim lights and soft music. The food was amazing and the servers were very attentive. Jinny, the manager, also kept checking on us to make sure everything was great. We even hit the private karaoke rooms afterwards which was so much fun. Definitely recommend! 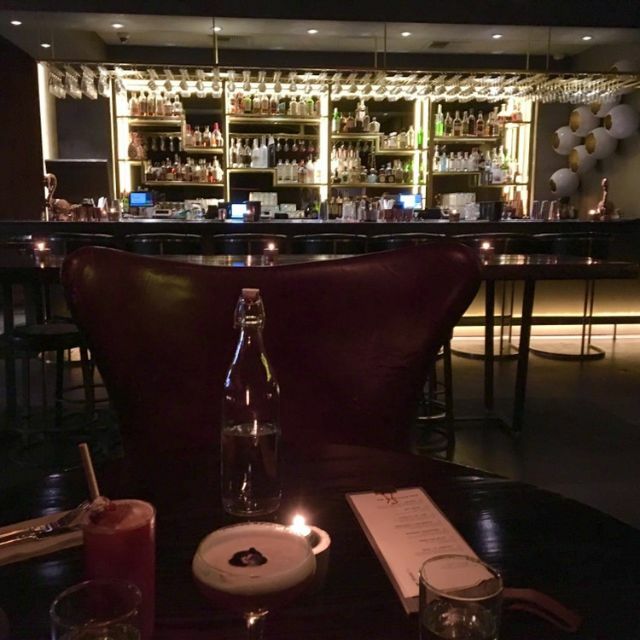 Had a really cool retro ambiance with a low lit bar and super trendy specialty cocktails. The Venue in Koreatown was like no other place I've been to in Koreatown. This establishment opened up just three months ago which is probably the reason why I've never stumbled upon it. The interior was beautifully decorated/designed giving off a very sophisticated and infatuating ambiance. 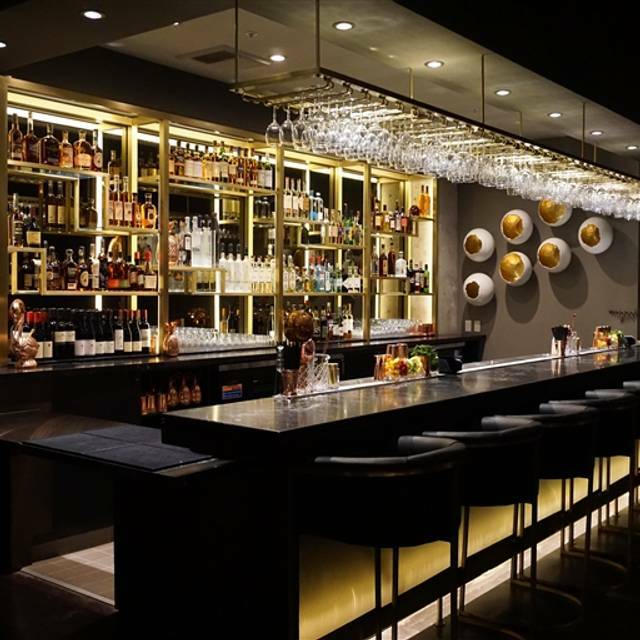 The Venue offers a full menu from appetizers, entrees, shareable plates, as well as a list of unique cocktails. Another pleasant surprise were the private karaoke rooms that were available for booking. They had about 11+ rooms, all of which were individually themed. Rooms ranged from different sizes (catering to varying party sizes). This place that I went out for date is amazing. We've tried their foods and drinks, overall everything was fresh and perfect. Their cocktails are so pretty, also bartenders know how to make drinks! It has perfect balance between sweetness and bitterness. I tried Whiskey houston, which based on jameson caskmate and kumquat and this became my favorite drink with one sip. For foods, we had tomato and burrata, octopus salads,pork belly, striped bass, ribeye and lamb. Every dish that I ordered came out perfectly specially octopus salad and ribeye were bomb. Apparently they also have the private karaoke room in the restaurant, I would definitely comeback for my upcoming events. This place is so much fun! We had dinner and then went into a private karaoke room. Yes, the place is a bit expensive but, for those occasional nights where you plan an evening with friends, it's worth it! We went on a Sunday and it was empty...which was perfect!!! The service from everyone was top notch. Jacob, Justin, and Andy were so attentive. I would absolutely come back. This place is great for birthday and friends get together. Be prepare to spend 80 dollars a person expensive. We went to The Venue and were very excited about it from all of the reviews. We really enjoyed our table. seats, and the ambiance...until it filled up. Then it was very, very loud. The quality of the food was not worth the price that we ended up paying. My wife couldn't finish the sea bass because it tasted like it had rotted...my friend specifically asked is the lamb was spicy which the waiter assured was not. Well, it was sitting on top a bed of spicy curry. So that didn't get eaten. My tagliatelle was fine, just the portion was fit for a child. Again for the price, I don't find it worth it. I probably will not go back. Additionally, we arrived at 6 PM and they had already run out of the half-chicken. Not impressed. First time there and it was amazing. Great service, delicious food and drinks and perfect environment for a birthday dinner. Too expensive for mediocre food. Service was attentive and decor was nice. Drinks are strong. But just overall too expensive for average food. It was excellent - would go back tomorrow! We tried this restaurant after seeing it on EATER short list. We did not book a private room, which might have been a different experience, but sitting in the main dining room had a OK meal but really nothing special. Food was contemporary but not innovative, and menu is pretty limited. Service was very friendly, but also very slow. Decor is modern -- lots of concrete, low and comfy seating, indirect lighting -- but predictable. I don't think we will return. I've heard a lot about The Venue since it opened so I made reservations for a client dinner on a weekday. I have to say, everything about my experience was great from start to finish. The octopus on the octopus salad was super tender and the dish was light, but extremely flavorful. We also had the shrimp toast, lobster ravioli and the short rib, and all the dishes were outstanding. The ravioli came with an soft egg in the middle, which you crack open and mix in the yolk, making the dish even more creamier and buttery. My favorite was definitely the short rib. Incredibly tender and juicy, it was the perfect combination of sweet and savory. I would also definitely suggest getting a cocktail from their list and their lava cake for dessert! All in all, I couldn't be happier about my dinner and will be back soon. Went on a Sunday night for a birthday dinner and it was amazing! I purposely booked a dinner reservation for a more quiet night of the week so that I could hear and enjoy my dinner guests. The only negative thing I have to say is that based on the street address alone, it is a little hard to find the entrance, but if you are familiar with how the shopping centers in Koreatown work you will be fine. Follow the directions for the valet provided on the internet (you can also self park) and you will be good to go! Service was great start to finish. We went for a full dinner but the appetizers were soo good and filling we ended up just reordering those. Drinks were well constructed. Decor was beautiful. I recommend everyone check this place out for a nice change from the "norm" in Koreatown! Came in from out of town to plan my friend's birthday gathering last minute and this place was a perfect fit! Everyone from the door person, our server and manager made us feel so welcomed! Their service is impeccable and the ambiance was just right. Try the pork belly dish for sure. If you're torn with picking out a place for a group...stop right here. I was nervous to try a new place but this place is very worthy. Can't wait to be back! I had my birthday party here and it was wonderful! I received a call the day before the party confirming my reservation and from there every single interaction with the staff was so pleasant and courteous. The bottle service and room charges get pricey but it was worth it for the special occasion! Loved everything about this place. Great food and cocktails and amazing service! Highly recommended! This place is hype!!!! I saw so many legit photos on ig and it looked exciting, but the food is not even close to being good. Not coming back, not my scene.